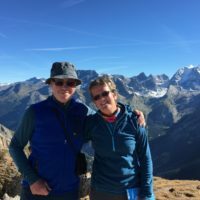 Cicerone publisher Jonathan Williams makes an early-season trip to one of France’s great one-week treks, a tour in the Vanoise that has pretty much everything the trekker wants, and almost nothing he or she doesn’t. The three French guys with big packs were at the four-way junction talking loudly in the quiet forest. I was determined to hold my pace, not to stop, so it was a happy ‘bonjour’ and on and up as the trail steepened. 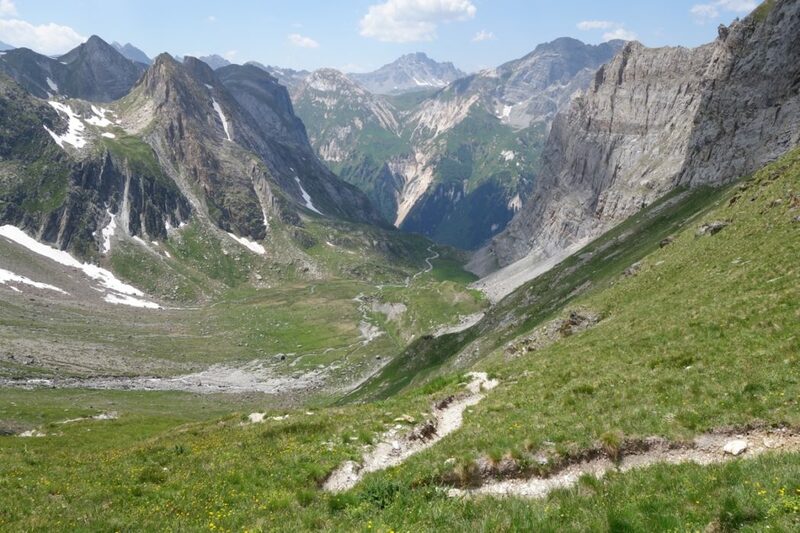 I am probably one of the strange few who enjoys the long and steep 900m climb from Modane to the Refuge de L’Orgère, one of the ‘gateways’ to the Vanoise National Park. I will meet them again later, and discover I had them all wrong. The Vanoise is France’s oldest National Park, founded in 1963. It clearly sees itself as the gold standard. The park fights and largely draws an uneasy battle with the ski industry. The resorts of Méribel, Courchevel and Val Thorens to the west are well outside the park and don’t intrude, while in the north Val D’Isère, Tignes and Val Claret do come right to the park edge and some routes pass through or around these resorts, which are perhaps not at their best in summer. Val D’Isère is a whole mid-sized town. The Park is a wildlife mecca, wholly undeveloped except for a few discrete refuges, mainly run by the PNV, the Parc National de la Vanoise. 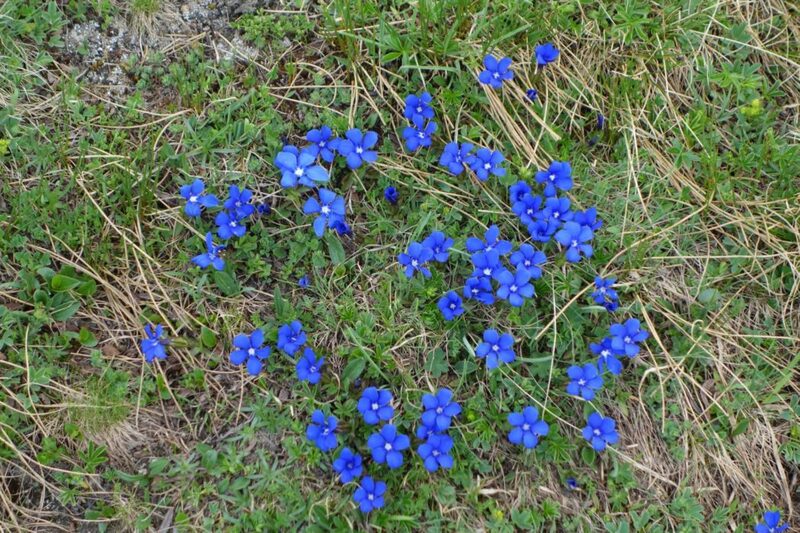 Early season flowers are some of the best in the alps, marmots proliferate, chamois and bouquetin wander the higher slopes, eagles and vultures guard the peaks. There is climbing too, generally easy–mid difficulty on the glacier routes but also a significant range of rock climbing routes. The Glaciers de la Vanoise is a short trek around a high and glaciated range, almost a plateau, of peaks, the highest of which are the Dôme de l’Arpent and the Dôme de Chasseforêt (3586m). The glaciers have receded but must have been spectacular in their prime, one of France’s greatest beauties. Now the glimpses are more tantalising than overt. 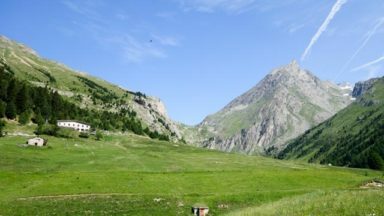 But these peaks are not the only ones: the trail wanders among 3500–3800m peaks including the La Dent Parrachée, La Grande Casse (highest in the range at 3855m), la Grande Motte, the Peclet, the Polset and many, many others. Not well known compared with Mont Blanc, maybe, but still wonderful mountains. 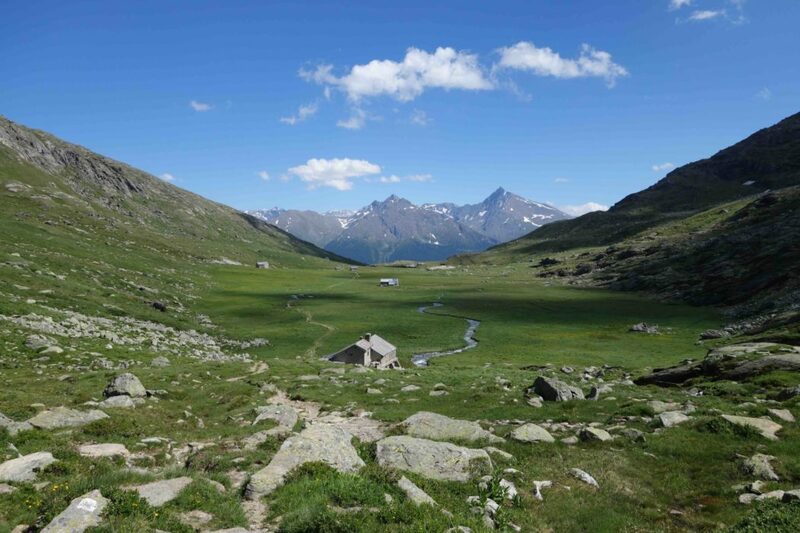 The Tour des Glaciers isn’t an official trail: it follows existing paths, including the GR5 and GR55 routes through the Vanoise to achieve its circuit. With no group of so-called wise men laying down the law, the trekker is free to improvise around the theme, both in stages and route. 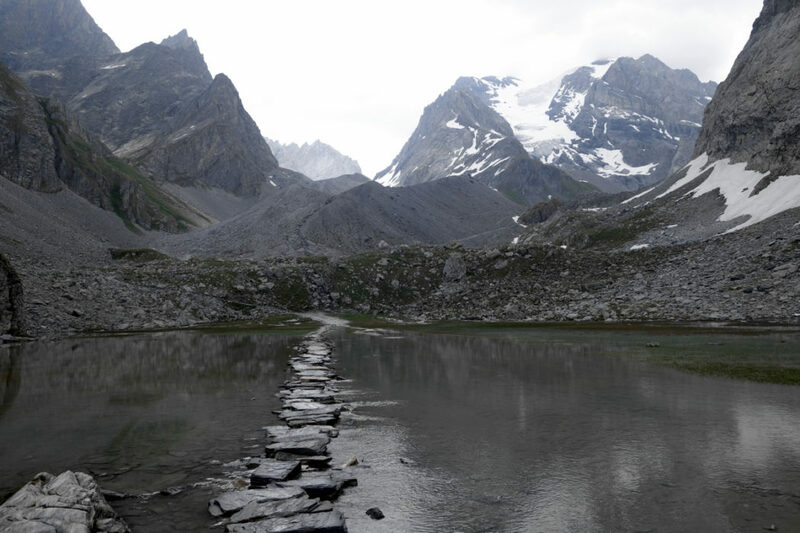 Those with time can explore into the eastern Vanoise up to the refuges of Leisse and Femma; in the west the trekker can choose valley or higher-level routes; and in the south there is a choice of cols – Aussois, Masse, Chavière – depending on how much time is available and how much challenge the trekker is looking for. 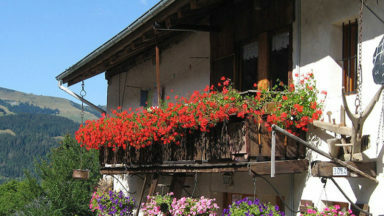 Access to the tour is often through Pralognan, a small resort town at 1400m approached from the north. For those driving this is probably ideal, a small safe resort to stash a car, get supplies and head off. It also provides the greatest flexibility for a short or long trek. My choice was Modane, a transport hub and industrial town to the south in the Maurienne valley and a major GR5 stopover. The trains from Geneva Airport to Modane came with an almost Swiss precision and took around 3hrs 30mins. Additionally, it would be possible to take the bus from Modane and start from Termignon, climbing to the L’Arpont refuge. Modane is no one’s idea of a resort. The Turin TGV line speeds access, then, like the main road, it disappears into a tunnel to emerge in Italy. On previous trips I had come and gone as quickly as possible, but a 6pm arrival meant I needed to stay in town at a small hotel near the station. Happily the temperature, at 28°C, was somewhat below that in Cumbria when I’d left. But at night the trains were gone, the traffic fell away and the people came out and, surprise, Modane was a proper French town again. Best of all I found an almost perfect floppy hat for €12. Should have bought two. My anti-clockwise route was to take me up the hill and along the eastern side of the range, round the north and then a high circuit before crossing two cols. This was a day of two halves, as the football guys say. Cicerone’s Tour of the Vanoise guide split it into two, on the assumption that the stiff climb to L’Orgère may be suffered through on the evening of arrival, before a gentle 5 hour walk to the next refuge. No such luck for me: the climb to the refuge was a steady 2hrs 10mins, and then the traverse around the Col du Barbier to the Aussois valley was a delightful walk. 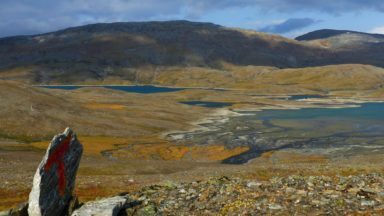 There is a choice of four refuges in this area, as well as a small mountain hotel, so there is ample accommodation. Mine was the privately owned Refuge du Plan Sec, a group of converted farm buildings with spectacular views east and south across the valley to Mont Thabor and new opportunities there. I was surprised when the trusty Suunto told me I had climbed 1750m. I teamed up with Gal, an Israeli who was walking alone. An IT and systems manager, he was a solid walker whose list of alpine treks was impressive. The 17km/5hr/+500m day to L’Arpont felt longer than it should have, probably a reflection of the previous day’s climbing. 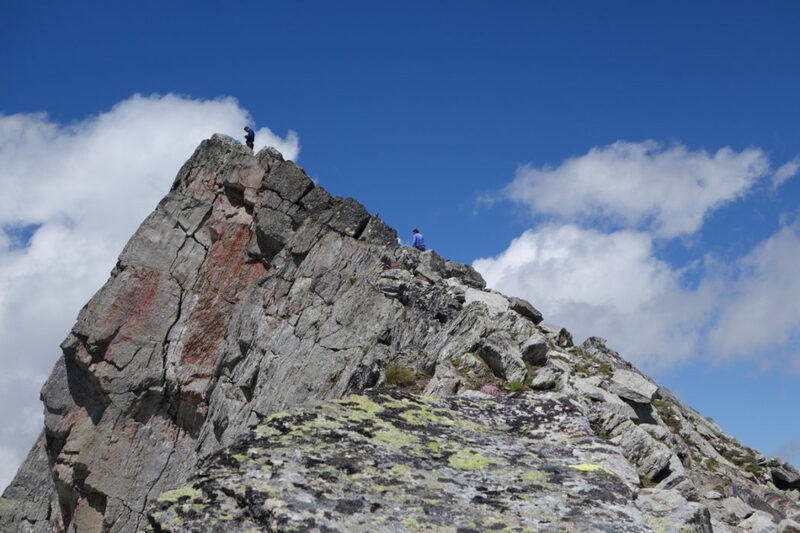 Most of the day’s effort is to walk round the impressive peak of the Dent Parrachée. The route climbs through an eroded section where the path construction has made what 10 years ago seems exposed into a straightforward steep section. It then makes a high traverse from ridge to col to ridge before eventually coming out at the PNV’s Refuge de L’Arpont. This has been rebuilt in recent years, and now has a magnificent new dining area and sun terrace as well as improved facilities. All are much needed as it fills a crucial spot, with other refuges several hours each way, and as a jumping off point for glacier routes it’s a busy place on summer weekends. Here I met up with the group of three I had passed on the first climb, not French at all but more Israelis exploring the range. They were lawyers, engineers, financiers. 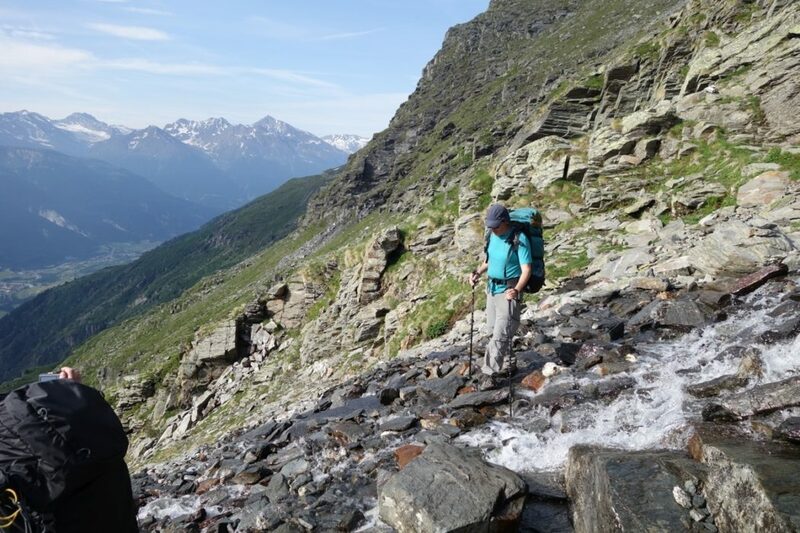 Another straightforward day, initially continuing the high traverse under the glaciers: with fresh streams coming down from the glaciers above, small lakes and green pastures, this is perhaps one of the most beautiful parts of the trek. All morning is spent approaching the Entre Deax Eaux area, nestled under the 1500m faces of the Grande Casse and Motte. Probably one of the most impressive crossroads highways in the whole of the Alps, five major routes meet here, all of which are great routes, either exploring high valleys or traversing steep mountains. Next my route climbed to the Col de la Vanoise, a huge and hugely impressive U-shaped region, more a valley than a col. 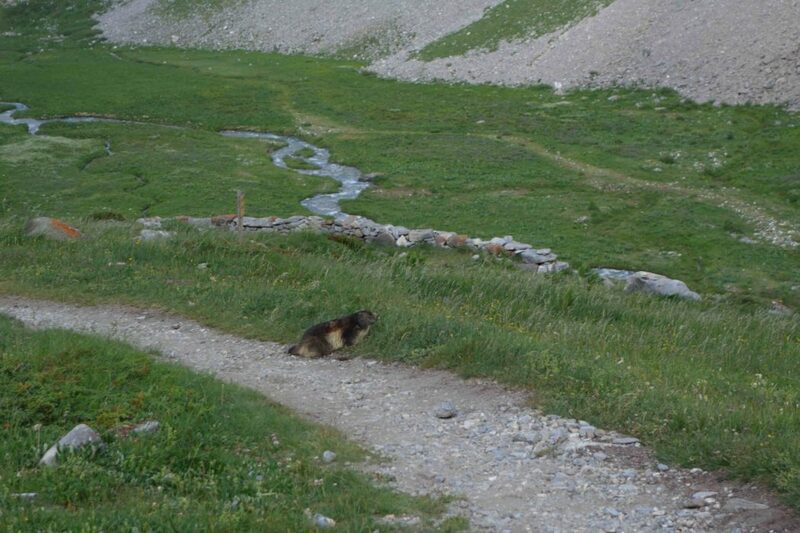 Flowers everywhere, marmots, chamois, the whole alpine shebang. And so to the next refuge, the Refuge de la Col de la Vanoise at 2500m, run by the CAF (Club Alpin Français). This has been totally rebuilt, a brand new refuge. We had passed by on our GR5 walk a few years ago and had a morning coffee in a Portakabin, so a brand spanking new refuge was most welcome. It’s an impressive place to spend the night, high among the peaks with the Grande Casse climbing grandly above. I could have saved some effort here, but I had planned to drop down to Pralognan at 1400m for some supplies and to report in after a few days without mobile signal. I had declined the pique-nique the night before, so was committed to the 1100m descent into the town. Pralognan was still asleep, more from the early season than the hour (10-ish) when I arrived. Still the Sherpa supermarket was open and, refreshed with coffee and cake, it was time to head to bigger hills. 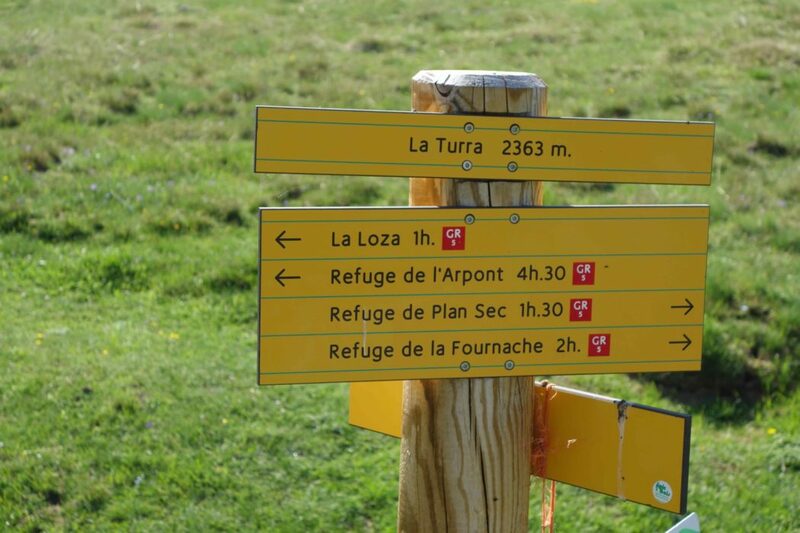 I had been studying the map for a couple of days, but I had spotted that I could rejoin a high traverse from the Col de la Vanoise to the next hut, the Refuge de la Vallette, and cross several cols. The climb to the first, the Grand du Grand Marchet at 2500m, was a good stern test, especially lower down when it used cables and ladders to cross expanses of steep and bare rock. As expected, just below the top snow and shale made the final 100m a challenge. 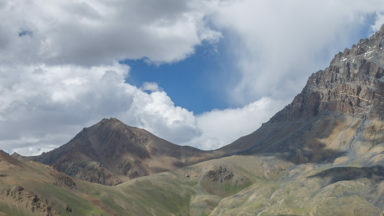 But the views of rock, valley and two spectacular waterfalls more than repaid the hard work. I crossed two more, smaller cols before arriving at the remote Refuge at 2600m. Also a climbing hut well sited for the glacier crossing and Dome de Chasseforêt, this PNV refuge comprised three huts in a great spot with 360° views. The guardienne (Sylvie) had advised staying high as the better route, as against dropping down to the valley (less interesting, more climbing, but quicker). The overnight storm left thick clouds which cleared gradually through the morning and I seemed to have the mountain to myself. 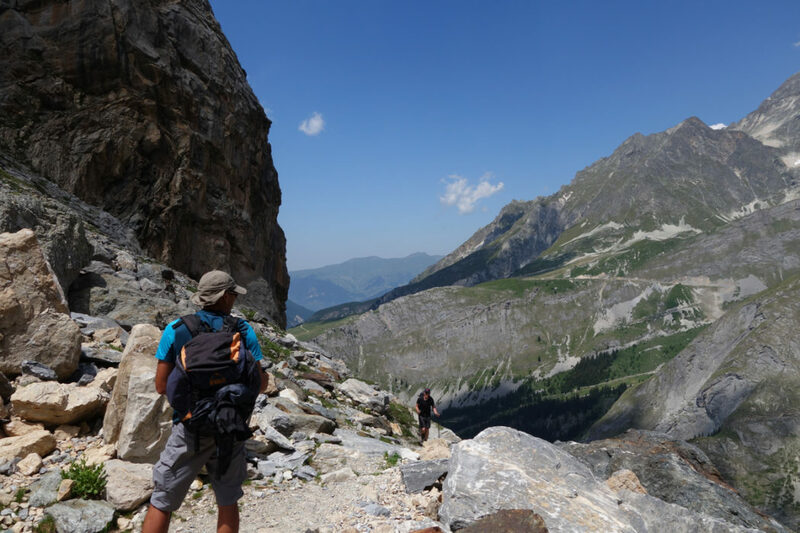 Traversing, climbing, dropping, the route rose through the Cirque de la Génépy before dropping to meet the path that climbed to the 2900m Col d’Aussois. This was another steep climb on a reasonable path, waymarks were few and snow patches small, before the gradient lessened and I came out at a broad col.
Just above this was the Pointe de L’Observatoire, a 3000m peak which I climbed quickly, although I backed off for the final horizontal 40m when my route, perhaps not the best, became a bit too ‘arrety’ for a solo trekker with a 10kg pack. It will still be there next year. Off trail I lost the path on the descent over rocks, re-joining it lower where it was all too obvious where I should have been. 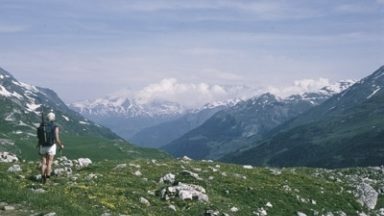 The CAF Refuge de Fonds de l’Aussois was right at the bottom of the descent, looking out over a green and flat high pasture. Another col day. Either I re-traced my first day or I tried the Col de la Masse, another 2900m col with another possible peak, the Rateau d’Aussois. I seemed in good shape, so it was the col for me. The climb was mainly straightforward, if steep, but the col was puzzling: just where did the descent start from? I left the Aussois peak as being just a bit too far, a bit too snowy, as a hint of rain passed through. The views south to Thabor and the whole of the Ecrins range were great but clouds were starting to gather, so it was time for second breakfast before the long descent of 1000m back to L’Orgère, a lunch of food not seen for several days (omelette and salad – green food!) and then the final 900m to Modane, where the train was waiting. • It’s high trekking, at over 2000m, and an early season visit will usually need an ice axe and maybe crampons. Check with the PNV and hut guardians before heading out before mid-July to understand the conditions. I carried microspike crampons, and used them once, on the final day. 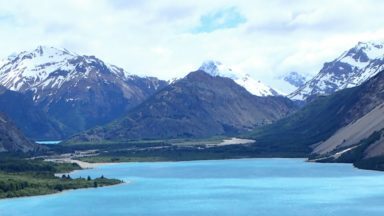 • Huts are open mid-June to mid-September. In June and September, it should be OK to call a day or so ahead so you are expected and are included in the hut’s meal planning (and they know if you don’t arrive, a big safety factor). In July and August, it is advisable to book a few days in advance. I called a couple of days before setting off and did the lot in 25 minutes. 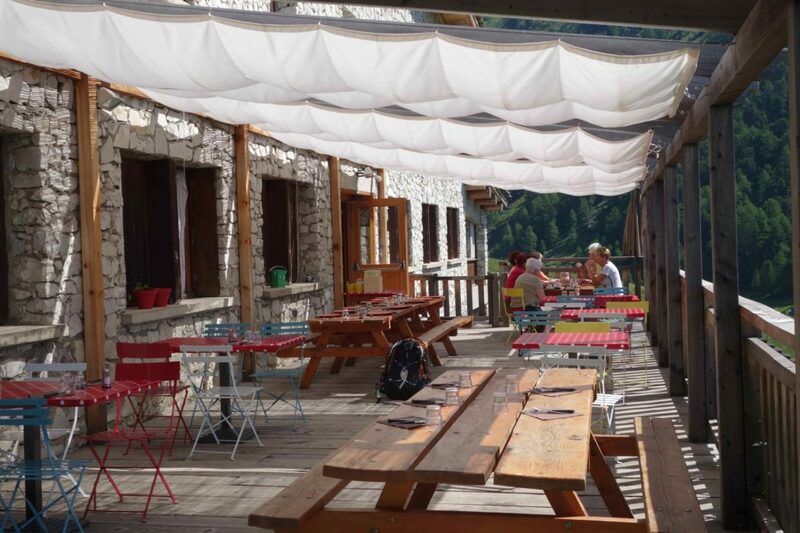 You can book them through the PNV website, (www.refuges-vanoise.com and click ‘Reserver’). • The huts do splendid picnics, especially if you like couscous. But there are no bins, even at the huts, so any rubbish must be carried and disposed of outside the park. 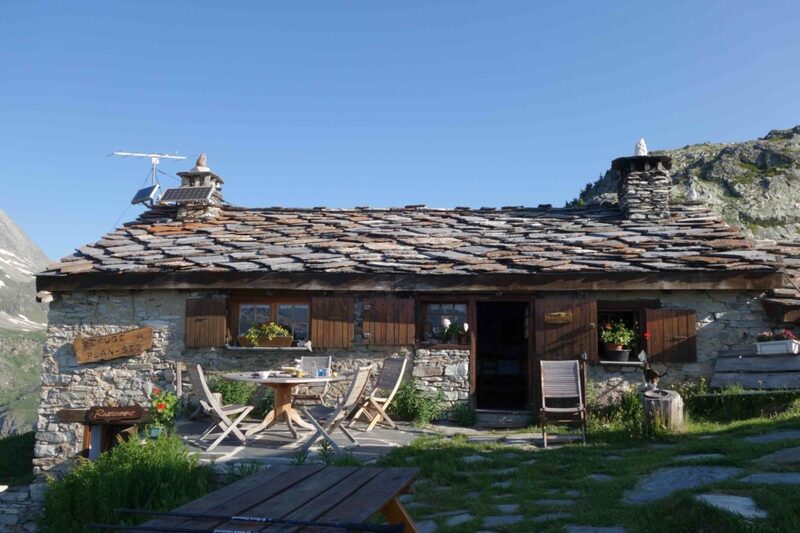 • Hut fees for demi pension are slightly over €40, so with a beer, a glass of wine, and a few extras you should come out at under €50 per person per night. Picnics would add to this. Pay in cash. • All supplies and outdoor gear, banks, pharmacies and most other services in limited form are available in Modane and Pralognan. • Phone reception is a lottery: L’Arpont had good reception, other refuges not at all. • Best learn some French, it’s primarily a French trekking area and dinner conversation flows much better. English is usually spoken, but don’t rely on it. Most efforts are appreciated. • I am confident that it is possible to take a taxi, or maybe even a bus, to L’Orgère, rather than climb, inevitably in hot weather. But is that cheating? • The route is described in Cicerone’s Tour of the Vanoise. 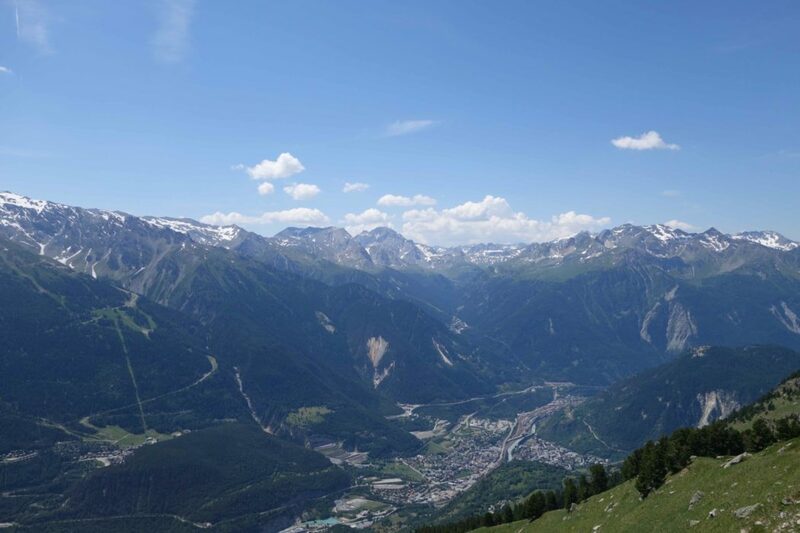 There are some differences as the book route stays low in the Pralognan valley and uses the Col de la Chavière rather than the Aussois to get back to Modane. It’s also written up clockwise, not anti-clockwise as described here. We will be doing a new edition of the book, expanded into a new guide to Trekking in the Vanoise in 2020.